After our whirlwind visit to Los Angeles in October 2004, we headed south to San Diego for the NAB Radio Show - and, of course, to visit some towers, too. We'd done a pretty comprehensive survey of the town in a visit in 2001, but things change, and it was a beautiful sunny day (as most days in San Diego tend to be), so we headed out to revisit a few sites and see what had changed. 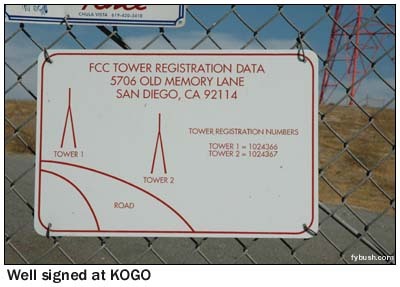 KOGO sits south of Highway 94 - and to the north, along 52nd Street, is the tall tower that's home to San Diego's AM 1360, a Clear Channel sister station to KOGO. 1360 was historically KGB, later KCNN and KPQP, and when we visited in 2001 it was standards as KPOP. A few months before our 2004 visit, it had flipped again, and it's now running progressive talk (not just Air America and Ed Schultz but a local show as well) as KLSD. The KGB calls live on on the FM side, at 101.5 from those eight bays at the top of the tower. And one big reason we wanted to stop and see this tower again this time is that there's still another station calling it home. It's not tremendously clear from the photo, but if you look carefully you can see a dark diagonal wire stretching down to the left of the tower. That's not a guy wire (the guys on this tower are white and made of non-conductive Phillystran) - it's the temporary longwire antenna for Salem's KCBQ (1170), which lost its six-tower site out in Santee and still hasn't completed its rebuild as a diplexed operation at the site of KECR (910 El Cajon), north of Santee. So for the moment, this tower at 52nd and Kalmia (an intersection we need to visit once more on a future trip, in hopes of picking out the transmitter building, which we now know to be disguised as a ranch house) carries both the lefty ramblings of Al Franken and the righty rantings of Bill Bennett. An interesting combination! Our 2004 trip had time for only a distant glimpse of the 442-foot self-supporting tower of KSON (1240) and KURS (1040) south of downtown in National City. 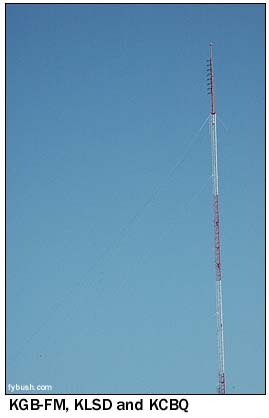 We'd photographed this beautiful behemoth in 2001 and admired the nifty call letters it displayed, and it was disheartening indeed to get word a few weeks ago that the top half of the tower had crumpled over in a storm just after Christmas. 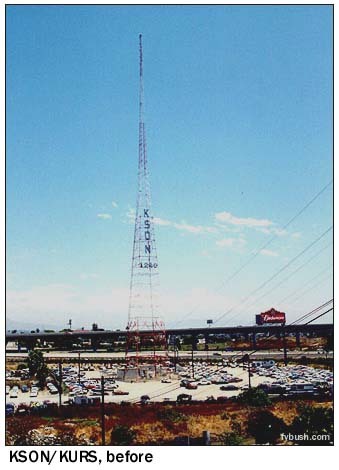 Bill Lipis kindly sent along a view of the tower as it appeared the next morning - and what a sight that must have been for commuters on busy I-5, which runs right alongside the police impound lot where the tower stood for so many years. 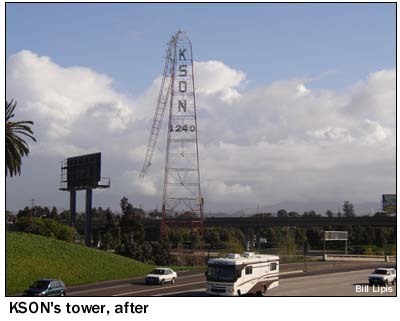 The good news is that the tower wasn't completely destroyed, and within less than 48 hours KSON was back on the air after crews had carefully removed the crumpled portion of the tower (and, sadly, the call letters.) 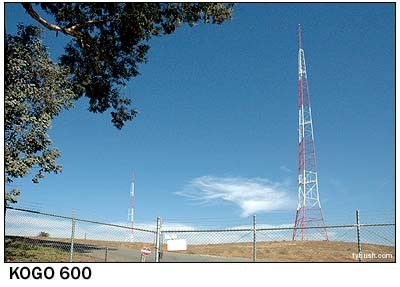 KURS, which shared the tower, has yet to return to the air, and low-power KBNT-CA (Channel 17) moved to a new site at Mount San Miguel after the accident. The story of KSON's return to the airwaves was a dramatic one, and you can read a first-hand account from chief engineer John Buffaloe (who's since moved on to Clear Channel in New Orleans) at the SBE Chapter 36 website. Who said engineering wasn't exciting? In our next installment, we'll fill in a big gap in our Southern California tower hunting. No, we didn't go to El Centro (where KXO lost its tower as well last fall), or to Palm Springs, but we did make it to North County San Diego, and you'll see those towers right here in a week. It's here - the 2005 Tower Site Calendar is now shipping! Click here for ordering information! Previous Site of the Week: We (Still) Love L.A.: KCRW, etc.